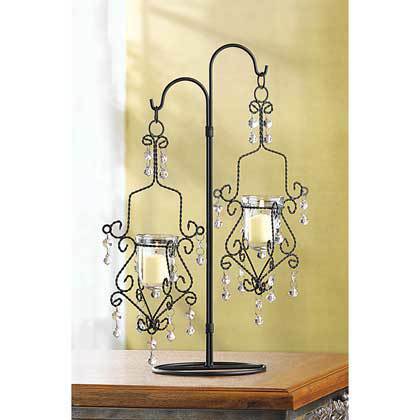 39059 Crystal Drop Candleholder home decor, jewelry, decor, decorations, electronics, fountains, floor mats, art glass, vases, garden essentials, fireplace screens. Candlelight reflects from countless crystalline facets, turning this bejeweled candleholder into a shimmering fountain of light. Graceful coils of twisted wire form a dramatic cradle for two free-swinging candle cups. A winning example of old-world artistry, warmed by a halo of golden glow! Wrought iron and glass. Candles not included. 11 3/8" x 6 1/4" x 18 3/4" high.